The world's first handheld computer, the HC-20's development was announced by the Shinshu Seiki and Suwa Seikosha companies in the fall of 1981 and the computer went on sale in July 1982. 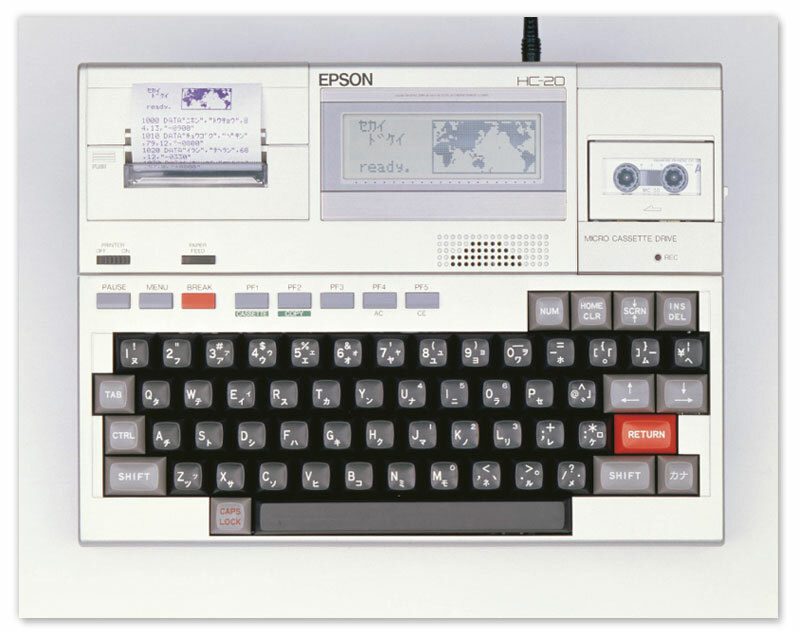 The A4-sized HC-20 was both compact and light — weighing only 1.6 kilograms — despite having a built-in 20-character x 4-line monochrome LCD monitor and a microprinter. It was built to a high standard for a personal computer and was loaded with BASIC for business applications and provided connectivity with peripheral devices. Designed for the computer and communications era, the HC-20 came with a special coupler that enabled communications with host computers. The model's primary features were as follows. （1）The size of an A4 sheet and weighing just 1.6 kilograms, the HC-20 was eminently portable, and, powered by internal NiCd batteries, it could operate for long periods. （2）The dual CMOS CPUs enabled distributed I/O processing. The HC-20 was standard equipped with 16 kilobytes of RAM and 32 kilobytes of ROM. （3）Internal ROM could be expanded up to 40 kilobytes. An add-on unit made it possible to expand ROM to 56 kilobytes and RAM to 32 kilobytes. The unit also accepted plug-in microcassettes and ROM cartridges. （4）The all-in-one design included an LCD monitor, a microprinter, a keyboard, a ROM cartridge (optional), and a microcassette drive (optional). （5）The HC-20 was loaded with a 32 kilobyte Microsoft BASIC compiler with extra commands and access to HC-20-specific functions. The computer could store and run five BASIC programs. It was standard equipped with real-time clocked LSI. （6）The HC-20 was standard equipped with an RS-232C port and a high-speed serial port. The computer could communicate data via phone lines by connecting it to the CP-20 personal coupler.